I have been based in La Quinta for about 35 years now. I’ve been a Realtor in Coachella Valley for 18 years and got my license first in Kauai, HI. Then I came back to La Quinta and got my California license as well. I started my Real Estate career working for Greg Norman’s development company, Medallist Golf Development, where I was the onsite Sales Manager and a top producer. I then transitioned into Resales. After working for a large Real Estate Brokerage Co. here in the Valley, I followed my broker to HK Lane Real Estate. An Amazing Company! We’ve been operating in the Palm Springs Valley for about 9 years now and we’re rated the #3 Brokerage in overall Sales, but #1 in Per capita income/agent! HK has 3 offices, (La Quinta Old Town, Palm Desert and Palm Springs), and about 150 Agents. Fantastic Brokers and an owner, Harvey Katofsky, who has been involved in Real Estate for over 30 years..he knows our Valley. HK Lane Real Estate does extensive marketing to complement its agents. Full page ads in the Real Estate Section of The Desert Sun Home finder run weekly, full page advertising in Palm Springs Life, as well as a website that links to Trulia, Google, Yahoo, Realtor.com, and the sites mentioned above. In 2012, HK Lane was named the only desert affiliate of Christie’s Inter-nation Real Estate. This is HUGE for HK Lane Agents. The International Market is exploding in the Palm Springs Valley and having the additional exposure on the Christie’s International website as well as their International Print Media boosts our International presence for Luxury Properties. Being a Luxury desert Agent, the addition of Christie’s International Real Estate is a tremendous benefit to the exposure my Luxury Properties ($1 million+), will be receiving. In addition, each of my listings has it’s own URL..making it easier to find. A full-time media person is employed to build and promote HK Lane’s presence in the Coachella Valley, and that corresponds with my own advertising/marketing presence. I spend most of my marketing time and money online, but I do run ads in the Desert Sun Home finder weekly insert, have a full-page ad monthly in Palm Springs Real Estate magazine-both the local one and also our Canadian edition, full-page ads in both Empire and Eldorado Polo Club mags for each season, and also a full page ad in the HITS horseshow magazine..and this is just print media! My online exposure is as good as it gets. I employ an SEO management team to push my social media presence on Facebook/Twitter/k2sells/u-tube/Activerain/Google+/Pinterest. I review and add online presence every December to keep up with the constant evolution of the internet marketing machine. I have been listing, working and CLOSING Short Sales for almost 7 years now..long before it became the rage to work them. I do not use a third party negotiation company, nor do I need one. I like to keep up on exactly WHERE each of my Short Sales Listings are in the process. That way, I can personally keep my Sellers and also the Buyers’ Agents informed as to the current status of the property. I am Certified with both SFR and HAFA designations, but my best certification is my dozens of satisfied Short Sale Sellers. Short Sales are difficult, but I enjoy the challenge. I have worked with most of the Lenders over the years and have developed a Short Sale Strategy that gets them CLOSED. For more information on the Short Sale process, or a free property consultation, please give me a call or send an e-mail. I played polo professionally for 18 years before I got into Real Estate. For a woman to make it in the polo world took focus and determination. That’s probably why Real Estate came naturally to me. 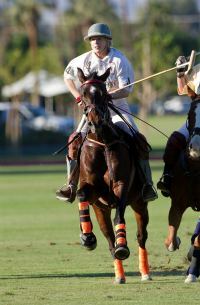 You can also check out a recent article written on my Polo Career here.